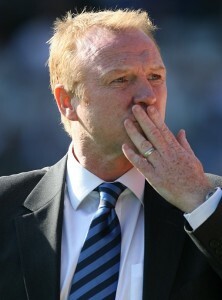 Would you trust Alex McLeish with a £40m transfer war chest? Giving Alex McLeish up to £40 MILLION to spend on new players in January, as new owner Carson Yeung has promised this week, is just fine if you want to piss away £40m on a collection of crap Scots, crap journeymen and crap Scottish journeymen. Otherwise it’s the biggest waste of money since Chelsea paid £30m for that Shevchenko fella. Big Eck, a manager who thinks nothing of boldly playing one striker up front at home against Bolton Wanderers, has a laughably dismal track record in the transfer market (a few names to conjure with: Lee Bowyer, Barry Ferguson, Marcus Bent, Lee Carsley, Stephen Carr, Gregory Vignal – talk about a lack of imagination; and what a bunch of has-beens), so I doubt he’s suddenly going to morph into some sort of wheeler-dealer from the Arry Redknapp School of Football Business. As such, in Yeung’s crocodile-leather shoes, I’d give McLeish NO cash, not even a fiver. Instead I’d do the inevitable, which means sacking him now and hiring a gaffer who knows his way around the football marketplace. Harsh but fair, and it’ll save you money in the long-term. Someone like Schteeve McClaren, for example.